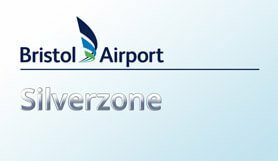 Silver Zone parking at Bristol airport provide a very popular service that parks your car for you as well as offering a transfer to and from the airport terminal 24 hours a day. Bristol airport parking Silver Zone offer not only great service but an attractive price, as well as being highly convenient. This is the Silver Zone Car Park, NOT Bristol Long Term Parking. Silver Zone is manned 24 hours and is well lit. CCTV and Automatic Number Plate Recognition are also in operation. All cars remain on-site within the secure, fenced compound of Bristol's International official car park. If your actual stay is longer than your booked stay, you will be charged extra on departure at the car park's standard daily rate. No refund will be issued for part used stays and any additional time will be charged at the local gate rate. Simply check-in your car and keys at the Car Park Reception for a rapid transfer to the terminal. The 24-hour courtesy bus takes just 4 or 5 minutes and drops you right outside the terminal door. The barrier will recognise your registration and rise. Park in arrivals and take your confirmation to Reception.If barrier fails to raise press the help button and quote your booking reference number. Exchange entrance ticket & APH confirmation for an exit ticket.